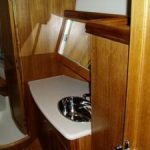 NickyNoo is a Legend 41AC (Aft Cockpit) sailing yacht. She is beautifully built to extremely high standards of quality and safety, offering performance capabilities suitable for all levels of sailing ability. She is exceptionally comfortable with a luxurious interior, perfect for entertaining the most discerning of guests and large enough to accommodate the occasional unexpected arrivals as well. 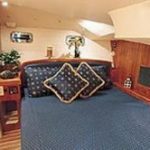 The space and comfort designed into NickyNoo has created a superb yacht suitable not only for weekends and holidays, but would equally make an ideal home for the live-aboard or long distance cruiser. These were important considerations when making our choice out of the many quality craft in this size class. Classified as a ‘Category A’ cruiser she is built for and capable of Ocean passages, taking both long coastal and offshore sailing in her stride. For the inexperienced yachtsman, the Legend 41’s ease of handling, manoeuvrability, balance, acceleration and stability provide a great sailing experience and yet, for the more experienced Yachtmasters among you, the only challenges are choosing the limits to which you wish to push yourself and the direction in which you wish to set sail. 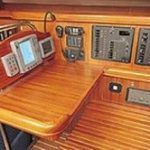 NickyNoo is set up for short-handed sailing, and together with the electronic navigation and autopilot features, she is an ideal yacht for the single-handed sailor. 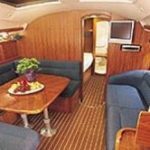 For the fair weather sailor, the interior boasts beautiful teak furnishings and surrounds, a spacious salon with large dining / seating area (seating 6 to 8 people) and a sofa. 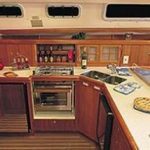 The galley would grace many small homes with built in microwave, fridge and plenty of storage in the built in cupboards and space under the galley floor to house the wine cellar. There are large work-spaces featuring genuine Corian® counter tops and a double stainless steel sink. There is even a built in drying cupboard for the crockery. The many windows and opening ports provide an interior that is always bright and airy. In the aft deck cockpit there is room to seat 8 people comfortably, so it’s never a difficult decision to put some nibbles on the cockpit table, uncork a bottle of wine from the cellar and enjoy the evening sun sat in the Marina or at anchor in beautiful sandy beached bay. Time to rest those weary sea legs? 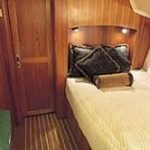 NickyNoo has an en-suite double berth forward stateroom, a huge aft master stateroom with queen size bed, both with interior sprung mattresses. When the unexpected additional guests arrive, the dining table will drop down to form another berth which could sleep 4 (at a pinch). NickyNoo is presently moored just north of Biarritz, on the idyllic coast of South-West France, awaiting her next adventure. Whether that will be for a trip out onto the beautiful coastal waters of SW France or just a quiet weekend in the Marina, it will still be a pleasure we hope to share. In the table below we’ve given you a [very] brief overview of NickyNoo’s specifications. I’m sure you’re not interested in knowing about the number of bins and storage cupboards (aside from the cellar tip above)? Please note some of the items below were not included as part of the standard specification of the Legend 41 when NickyNoo was built and commissioned. A brief introduction to NickyNoo, but we hope you’ve learnt a little about the Legend 41. There will be more to come in later posts. If you have any questions, please let us know via the Contact Us page. Remember, you can always keep in touch with us at Facebook or Twitter for all the latest news and updates from NickyNoo.com.